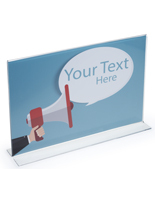 Vertical Sign Holder w/ Polished Edges Fits 11" x 17"
5" x 7" 8.5" x 11" 11" x 14"
Vertical Sign Holder - 11" x 17"
This vertical sign holder is designed for displaying graphics, photos, or ads in a "T" style frame. 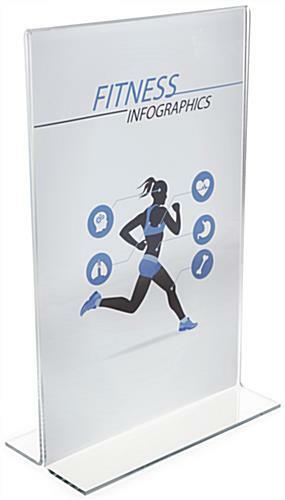 Eachh transparent graphic holder is 11" wide by 17" high with a bottom loading design that is ideal for many commercial applications. 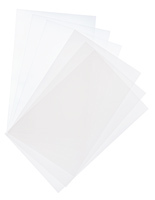 Paper slips easily in through the bottom and sides, so you can add all kinds of custom signs. 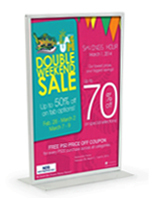 Because each sign holder is made of durable and clear acrylic, you don't have to worry about cracks or splinters throughout the years. 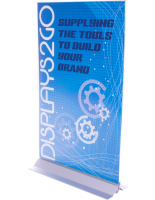 These displays truly stand the test of time! 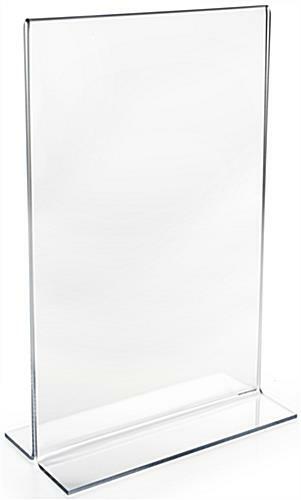 It''s not easy to find acrylic stands this size. It's great product. 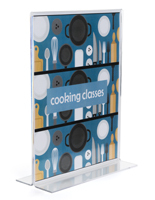 I had previously ordered 6 of the 11 x 17 acrylic sign holders and quickly found I needed more! They are crystal clear and super sturdy. 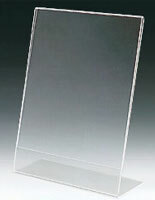 We take care to clean and store our sign holders just like fine china! Best product at this size! 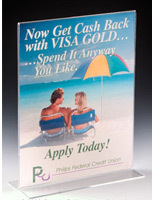 The 11 x17 acrylic sign holder is the best product we have used for its size. 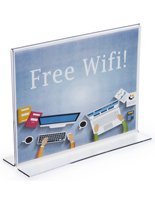 It is super sturdy acrylic and eliminates the need for backing material and a table-top easel which is how we used to display signs. 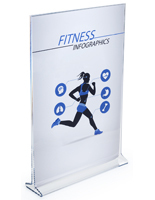 This sign holder provides a sleek, clean, less cluttered look for all our displays. So worth it! We are glad you were so happy with your order, Julie! Thanks for the feedback. These sign holders really stand up. They do not crack across the top with use as they are very thick. Always come well packed so no breakage on arrival. This is our third order at least as we keep finding more uses for them.